Beaming with rich blend of flavors, this colorful sauce looks great on the plate and goes perfectly with white rice. 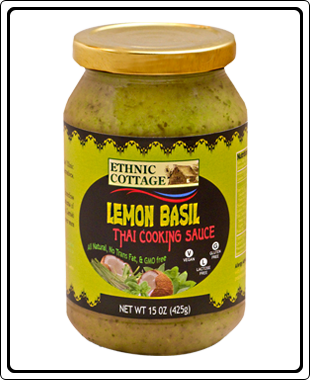 Ethnic Cottage’s Lemon Basil Thai Cooking Sauce contains No preservatives, No MSG. Ingredients : Water, *Coconut milk, Evaporated Cane Juice, Fresh Garlic, Fresh Ginger, Coconut, Fresh Basil, Thai Green Curry Paste (Coriander seeds, Cumin seeds, Lemon grass, Shallots, Garlic, Cilantro, Scallions, Galangal, Onions, Lemon Juice Concentrate, Sea Salt, Expeller Pressed Canola Oil, Water, Hot Green Peppers, Shrimp base (Baked Shrimp, salt, potato flour, butter, natural flavorings, dry whey*, spices, paprika and Tocopherol), Fish Sauce, Anchovies), Expeller Pressed Canola Oil, natural flavors and extracts, and Xanthane Gum. Cooking Directions : Place 2.5-3 pounds of boneless chicken in a skillet. Pour in contents of jar and 8 oz of water. Cooking over medium heat with occasional stirring for 15-20 minutes or until the chicken is thoroughly cooked. Garnish with fresh chopped Parsley and serve over warm sticky Rice, or Thai flat noodles. Serves 10-12.